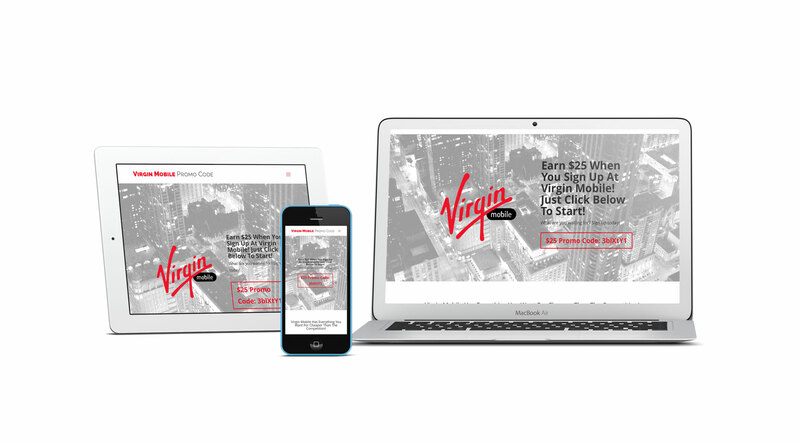 The Studio developed and created a one page, mobile responsive informational website for a client looking to earn affiliate income by offering their discount affiliate code to prospective Virgin Mobile customers (VirginMobilePromoCode.info). The client wanted a high impact design that would grab visitors attention and provide an easy and simple way to utilize the discount code. The client didn’t want a highly customized logo, but rather a generic looking logo and brand to keep the focus on the discount offer and the value offered by Virgin Mobile. With high impact and attention grabbing graphics, images, colors, and designs, The Studio was able to create a one page and mobile responsive website that fit the clients needs and requirements.